It is difficult to classify some projects e.g. are they North, East, West or Central?? Check out other areas on this page. In particular, see also these pages: Old Town, South Central Edinburgh and Tram documents. St James & Leith Street issues are below but for Picardy Place see the Leith Walk page – although note that some of the St James material is also relevant to Picardy Place. 1806 CCWEL (City Centre West-East Link) Traffic Regulation & Redetermination Orders TRO/17/91 June 20 Committee Report on objections [link] Report approved 7-4, with supportive Coalition & Green amendments and rejected LibDem amendment to delay. Spokes letter to Committee [pdf]. 1712 Leith Street TRO-17-81 & re-issued RSO-17-13 The TRO TRO plan1 TRO plan2 TRO plan3 The RSO RSO plans The TRO removes the bus lanes, defines parking rules, etc. The RSO redetermines the use of various areas of carriageway, footway etc. 1609 Edinburgh St James Council approval for PA 16/02791/AMC [rtf]. Our submission is in 1607 St James below. Our cycle parking point is adopted but nothing on cycle access, though there will be a further slight opportunity when TROs come out. 1607 East-West City Centre route, Roseburn-Leith Council bid for Sustrans CommunityLinks+ funding. Executive summary of bid [pdf] Council presentation to judging panel [pdf] Spokes statement to judging panel, showing wide range of cycling orgs support [pdf]. 1607 St James Quarter/ Leith Street Developers submit Planning Application 16/02791/AMC including details of cycling aspects. Main transport document [pdf]. Spokes submission [pdf]. [For the full PA, search for 16/02791/AMC here]. 1606 East-West City Centre route, Roseburn-Leith Report on January consultation [pdf]. Revised Council proposals following consultation, including Roseburn options A & B [pdf]. Option A map [pdf] Option B map [pdf]. Spokes comments on revised proposals [pdf]. 1606 George Street – design principles. Committee report 7.6.16 [pdf] – cycle lanes separated from moving traffic by parked cars, but design details awaited. News article by Broughton Spurtle. 1507 St James Quarter/ Leith Street Decision meeting committee papers. Main report [pdf 413k] was approved. See sections 3.3(i) and 3.3(l). Our objection (below) unsuccessful re Leith Street, whilst details on north-south James Craig Walk route will await a Traffic Regulation Order. i.e. no improvements at all from our detailed objection (below). 1404 George Street one-year experimental TRO/14/13 plans [pdf 513k]; Statement of reasons [pdf 67k]; Spokes response [pdf 261k]. Interesting response from an individual [pdf 84k]. Implementation timescale [link]. Not fully open till early September [link]. 1403 George Street one-year experiment Spokes response [pdf 261k] to stakeholder consultation version* of TRO [pdf 251k]. Herald article 10.3.14. * Note – the stakeholder consultation is a statutory requirement before the public advertising of the TRO, and is conducted by letter, not on the council website. We scanned the letter, as above, but only scanned one bit of the several pages of A3 drawings. 1310 CEC Transport Committee 29.10.13 Building a Vision, decision [pdf 517k]. 12 month experiment: 2-way buses+bikes stay in Princes St, no cycle route, but 2-way route in George St (presented as a link in National Cycle Network). 1305 CEC Transport Committee 4.6.13 Report on the Building a Vision consultation [pdf 499k] – despite the consultation results, no cycleroute on the north side of Princes Street. Spokes briefing to councillors seeking an amendment [pdf 94k]. See also news item 31.5.13. Circular to Edinburgh members re lobbying councillors [pdf 110k]. Posters to lobby councillors one [pdf 33k] two [pdf 99k] three [pdf 99k]. 1303 CEC Transport Committee 19.3.13 Building a Vision for the City Centre paper [pdf 1.3MB] – a vision which bans eastbound cycling!! See Spokes news item 15.3.13. Spokes response to the consultation [pdf 1.2MB]. Imaginative Sustrans Scotland response [pdf 942k]. 1301 Spokes Princes Street petition – exact wording plus summary of actions already taken by Spokes and others from 2009 to the present [pdf 113k][and there was much pre-2009!] The petition is open for signing on the Council petitions web page Jan 28 – Apr 28, 2013. See also our Jan 28 news item and Feb 5 Evening News article. The officials’ report [pdf 557k] on the above to the Edinburgh Council 22.2.11 Policy and Strategy Committee. Spokes prepared a briefing [pdf 108k] on this official report, which we felt seriously downplayed the role of cycling, especially in Princes Street (despite very positive Gehl recommendations). At the Committee, Cllr Steve Burgess got agreement to the most important single item (3a) in our briefing (the specific inclusion of cycling in the draft action plan for Princes Street). The Head of Planning also told the Committee, ‘it is not the intention that cycle lanes are squeezed out but are part of the solution’. For more on this episode see Spokesworker 07.03.11 [pdf 226k]. But – in a report to the 10.5.11 Transport Committee [1MB] this was not included in the draft action plan, and only through Spokes diligence was this discovered. We again contacted Cllr Burgess, who obtained a high level assurance that cycling would be properly covered [txt 3k] in the consultation options for Princes Street and the surrounding area. The consultation is still awaited and we understand it is likely not to be until well into 2012. [July 2012: no sign of action on this yet from the newly elected council – they are too taken up by the immediate tram construction issues]. 0911 Scotsman editorial – interesting article [22.11.09] on the future of Princes Street for cycling, walking and buses, now that trams are coming. 0904 Future of Princes St – Spokes Public Meeting chaired by BBC’s Lesley Riddoch and addressed by then CEC Transport Head Marshall Poulton. See our meeting report [pdf 122k] and a Scotsman report. 09xx Princes St bike lanes removed [Spokes 103 p2] Despite much Spokes lobbying, including a report by a Dutch traffic engineer brought over under a Spokes initiative [entry 0812] the tramline layout onstreet is designed ‘tram-only’ – not as an integrated transport project – and with high priority to subjective visual appearance – which will lead in future years to unnecessary tramline bike crashes and even to the threat of a Princes Street bike ban [1303 above] in a city committed to 10% of all trips by bike by 2020. 0704 St James Quarter Development Principles – virtually nothing on cycling; great interest in visual aspects. 0006 Spokes/Sustrans Bikefest celebrating NCN opening. The red Princes St bike lane can just be seen at the left. 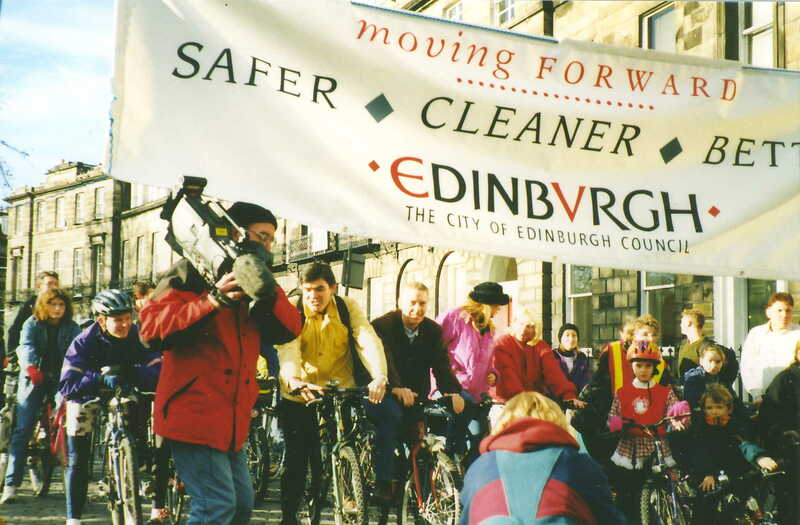 9611 Princes Street Bike Lane proudly opened 17 Nov 1996 by City Council Transport Convener Cllr David Begg, accompanied by 3 other councillors and 4 senior officers.